Many couples choose DJ’s to play music at their wedding reception and dance, but how do you get the best DJ? Someone who knows how to get the party started and keep it going long after the kids have fallen asleep and the older couples have retired for the night? 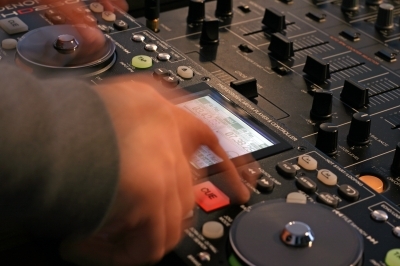 You need a DJ with energy, great music and a fantastic personality. Where should you look for this winning combination? Start with the weddings you’ve attended, did you like the DJ? Or has someone you know been to a wedding recently and raved about the DJ? Well these are great places to start looking, referrals are the free gems of your wedding planning crown. Keep a list of the DJ names that have been referred and check out the DJ’s for your self. Here’s what you should be looking for in your wedding DJ. 1) First impression, was the DJ polite, friendly, and enthusiastic about playing your wedding? If they were polite, but not friendly or enthusiastic, try someone else. Their business is their personality, if they can’t bother to be friendly or enthusiastic about playing your wedding do you really want that person there? If the DJ can’t be professional on the phone discussing business, then call the next DJ on your list. 2) Does the DJ dress up for the occasion? If they only wear street clothes to perform, then I would probably pass, it’s not professional to go to a wedding and not dress up. Unless you’re cool with that, then go ahead and give them a shot. 3) DJ Divas can be a party killer. This is a DJ who doesn’t take requests from anyone, not even you. If the DJ refuses to take requests, I’d probably scratch them off the list and continue my search. But if the DJ says that they will take requests given in advanced, that works, just get your guests to send their requests to you with their RSVP cards. 4) Video proof of their fabulousness. If the DJ has a YouTube video of a party they’ve played, or a video portfolio for you to watch, definitely watch it! This is your chance to see what you’ll be paying for. If you like what you see, give that DJ a check mark and a gold star. Then try to book them! After you’ve got the DJs narrowed down, now it’s time to talk contracts and responsibilities. Ask what their contract stipulates and what are you responsible for providing if anything. Most DJ’s have their own equipment and will take care of transporting it to and from your venue. But you should ask if they’ll need a dinner supplied to them so you can count them in your plate count. And last but not least, maybe keep some cash aside for them at the end of your wedding night. If the DJ did an out-of-this-world job, you should give them a gratuity!